We were asked to develop a series of micro sites for green energy provider Ecotricty. The brief was to work within the existing brand guidelines and design a series of microsites that featured affiliate offers between Ecotricity and other environmentally friendly retailers such as The Natural Collection and the Ethical Superstore. 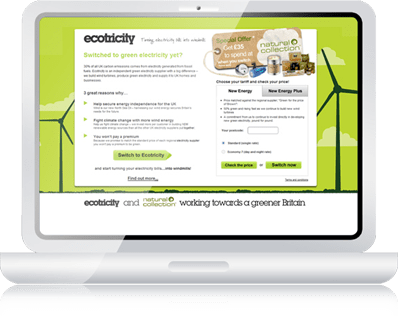 The designs we produced provided apace for both the offer message and promoted an on-line survey which Ecotricity were promoting to discover more about their potential customers and their opinion on green energy matters. We designed a label device to feature the offer bundle and the call to action.